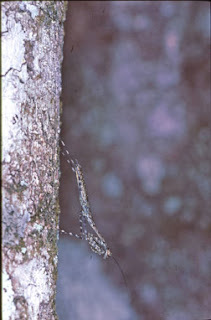 In most parts of Australia one or more species of mantid can be found on tree trunks. They are cryptic with colours and patterns which aids in ambushing small prey. 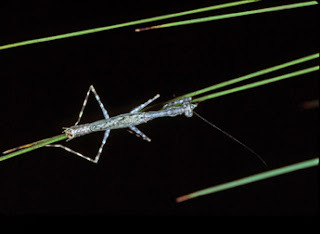 These mantids are extremely fast and dart to the opposite side of the tree or branch when discovered. 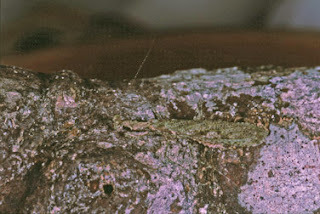 Egg cases (oothecae) are deposited in cracks in the bark. The top photo is a nymph of the genus Ciulfina, a commonly encountered genus with many species in the Australian tropics. They usually perch head downwards with the body flat against the tree not casting a shadow. This one is ready for a quick escape. The late John Balderson discovered that males exhibit asymmetrical genitalia, with some males oriented one way and others that have a mirror image of this complex. 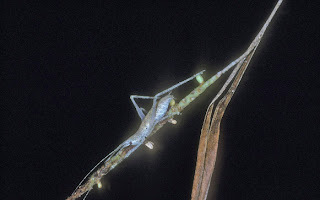 After dark these mantids move from tree to tree over the adjacent vegetation as in the second photo. The bottom photo is Calofulcinia oxynota La Greca, a delicate rainforest species. Males are long-winged and frequently show up at lights. Females are flightless and live on mossy rocks. 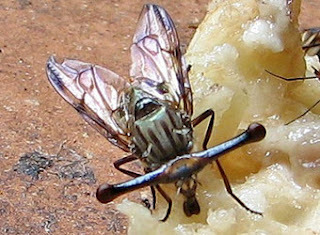 Have you Ever Met A Stalk-eyed Fly? 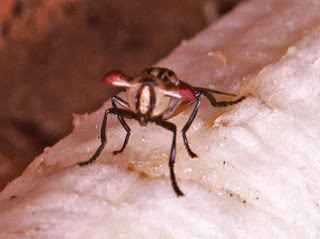 Stalk-eyed flies (family Platystomatidae) are common visitors to the bird-feeder during the rainy season where they are attracted to fruit. Several species are involved. Males have characteristically-shaped heads that are used in ritualistic mating displays. They have an unusual gait and are very easily approached. 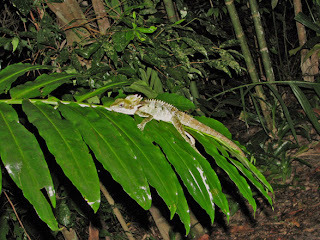 Boyd’s Forest Dragon (Hypsilurus boydii) is one of the true gems of the rainforest. Males are larger than females and can attain 50 cm in length. When alarmed, like other dragons, it can become bipedal, that is, is can run on its hind legs like a little dinosaur. 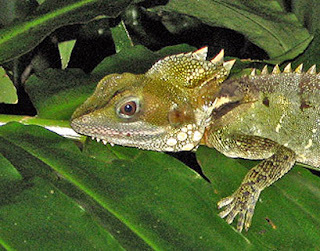 This lizard is not commonly seen because it spends a lot of time in the canopy where it searches for insects and other invertebrates. Most people discover the dragons basking in the sun. However, at our place we normally see them at night where they sleep. This Dragon was first spotted sleeping on a large ginger frond in March during the rainy season (we had 1000 mm of rain in March!). After a few weeks, it disappeared but reappeared again on the same ginger frond in early July. The Queensland Palm Katydid (Segestidea queenslandica Rentz) is a large insect with females (the larger of the sexes) measuring around 9 cm (3.5 inches) from the head to the tip of the forewings. Males are a bit smaller. They are known from rainforests around Cairns and Kuranda and the Daintree River area of far north Queensland where they are relatively common. So it is rather surprising that the species was unnamed in the scientific literature until recently (see Rentz, below). The fact that such a large insect, one of the largest of Australian katydids, can go unnamed for such a long time is an example of just how poorly studied the Australian insect fauna really is. I had known about the existence of the insect since the early 1980’s and had been collecting information on its biology and distribution since those early collections. This katydid is peculiar in some respects. Males are very rare. in fact, only one is known. Females are fairly common and many rainforest folk are well aware of the species. Study of captive females reveals that the species is http://www.blackwell-synergy.com/doi/abs/10.1046/j.1420-9101.2001.00254.xfacultatively parthenogenetic, that is, females can produce eggs that hatch without the mother ever having been mated. The species has been raised through several generations in the Museum of Victoria, Melbourne, without any males ever being produced. Another oddity associated with this species is its food. It feeds only on palm leaves. 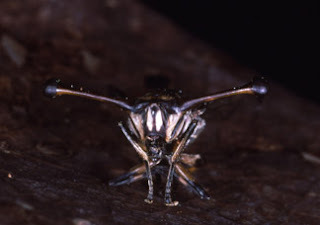 It has mandibles that are unique and appear to be modified for this purpose. Other members of the genus occur throughout the Pacific and some cause major economic damage to Coconut Palms. This species feeds on a variety of palms and because of its size and appearance is an excellent zoo animal and easy to raise in captivity. 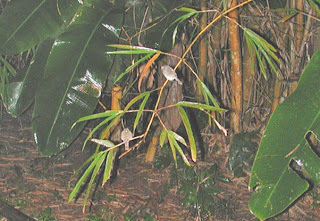 Females need to descend from their perches in palms to deposit eggs in the ground. This is when they are easily seen and subject to predation. Eggs hatch in late autumn and the juveniles (nymphs) seek small palms for feeding. Lawyer Palms (Calamus spp.) are usually chosen because the leaves are tender and there is an abundance of seedlings in the rainforest. 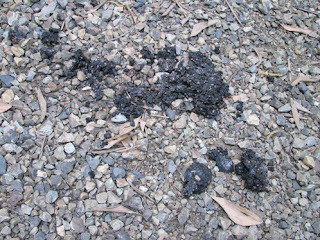 The nymphs are protectively coloured (see photo) and resemble bird droppings with their white, mottled pattern. As they mature they ascend palms and change their colour to mottled brown and after the final moult, the adult dark brown colour is achieved. 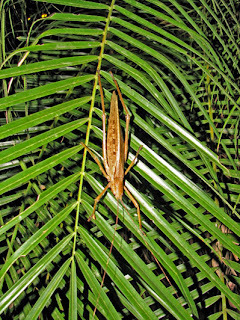 The Queensland Palm Katydid recently was featured on the TV show Totally_Wild where its biology and habits were noted. Rentz, D. C. F., Su, Y. N., Ueshima, N. 2006. Studies in Australian Tettigoniidae: The Mecopodine Katydids Part 2 (Orthoptera: Tettigoniidae; Mecopodinae; Sexavaini) Queensland Palm Katydid. Transactions of the American Entomological Society, 132(3): 229-241. If you own a Budgie or Cockatiel you may have noticed that the bird usually sleeps on the same perch in the same place night after night. Well wandering about the forest at night I have discovered that some forest birds do the same thing. 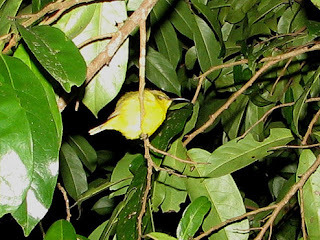 This Sunbird was seen sleeping on the same centimetre of the same branch night after night for about 5 weeks in May-June. It’s disappearance was no doubt prompted by the fact that the branch was pruned by a falling adjacent branch. No trace of the bird was seen there after. This Silvereye was observed sleeping on the same branch for more than 6 months in 2006 until its branch “disappeared” due to natural pruning. Each night the bird was observed in the same position on the branch. At times it was accompanied by another Silvereye but it was mostly on its own. Ants and Raspy Crickets are known to have elaborate methods of finding their way back to their nests after a night’s foraging (see references below). They use the stars as guides by taking a mental “picture” of their surrounds before leaving and are able to find their way back to their nests and shelters after a night’s foray. In addition to the above, the Raspy Crickets (see the two photos) have individual marking pheromones that enable them to find their own shelters once they are in near vicinity where they began their journey. 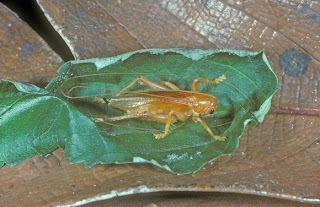 The cricket in the leaf enclosure is Xanthogryllacris punctipennis Walker. It, like all others in its family is active only at night. 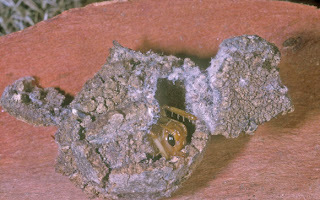 The other Raspy Cricket is an unknown species in an enclosure made from chewed pieces of bark. These crickets, like others of the Gryllacrididae, use silk, spun from the mouthparts, to secure and reinforce their shelters. So it was with interest when this butterfly- the Varied Eggfly, Hypolimnas bolina-was seen night after night in May-June in the same shrub in nearly the same position. But discussion with Michael Braby suggested that the butterfly might be hibernation rather than returning home after a day’s foraging. 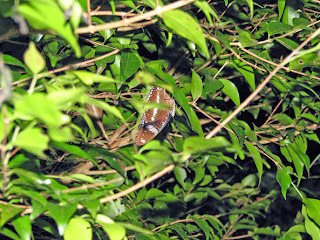 A check of the site at a number of times over a period of days revealed that the butterfly was still at home. It was sedentary. Then in early July, it disappeared and has not returned. Braby, M. F. 2004. The Complete Field Guide to Butterflies of Australia. 340 pages. CSIRO, Melbourne. Hale, R., Rentz, D. C. F. 2001. The Gryllacrididae: An overview of the World fauna with emphasis on Australian examples. Pp. 95-111. In: The Biology of Wetas, King Crickets and their Allies. (L. Field, ed.). CABI 540 pp. Lockwood, J. A., Rentz, D. C. F. 1996. Nest construction and recognition in a gryllacridid: the discovery of pheromonally mediated autorecognition in an insect. Australian Journal of Zoology, 44: 129-141. It is said that Cassowaries are crucial to the survival of the rainforest since many seeds are too big to be distributed far from the source tree. Cassowaries swallow seeds whole and the action of their gut rasps off the softer parts which are digested. This leaves the majority of seeds entire in their droppings. 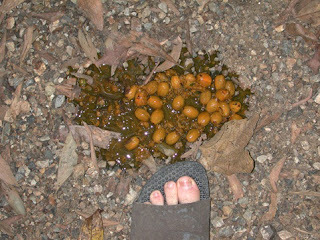 This is a ready-made source of food for forest rats, birds and Musky Rat-Kangaroos. Many seeds survive and germinate thereby distributing the trees through the habitat. Research has shown that most seeds are processed within about a kilometer from their source. In addition to plant material, Cassowaries eat a considerable amount of animal material when available. They readily eat beetles, moths and grasshoppers and other insects. They have been observed feeding on road kills and there are reliable reports of the birds eating Cane Toads (Bufo marinus) without any ill effects. 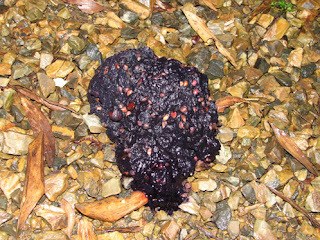 The photos show the fresh poo and its contents and then a few days later after the forest fauna has had a go at picking over the seeds.